Author: Abraham Wéga Simeu. Series edited by: Wilhelm J.G. Möhlig, Bernd Heine. 18 pp. Roman, 339 pp. 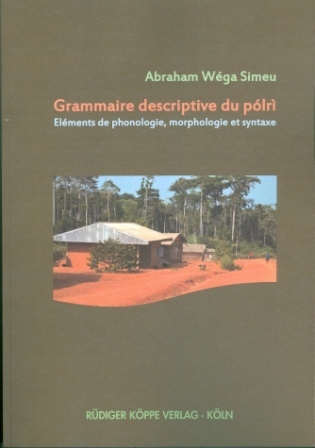 Pólrì is spoken in Cameroon in the East Region, or more precisely in the departments of Haut-Nyong (in the communes of Doumé & Dimako) and Lomet-Djérem (in the commune of Bélabo). The speakers of Pólrì are called Pól and are estimated at around 44 000 persons (Grimes, 2000). Pólrì belongs to the Bantu languages of the Zone A by Guthrie (A.93) and is in transition with the group of the Kako languages. The work describes linguistic elements of Pólrì and analyses phonological, morphological and syntactical structures. The classification of Pólrì as a Bantu language often caused contradictions, since it's at the frontier of Bantu languages of Zone A or Northwest Bantu languages and Ubangian languages. Pólrì reveals many particularities and innovations compared to other Bantu languages of Zone A. The study contains several fields of interest, where the structure and the internal organisation of Pólrì is analysed initially. Moreover, there is a scientific contribution that should lead to a better knowledge of the Northwest Bantu branch. In addition, the work contains necessary and essential elements of a didactic manual with the objective to teach children Pólrì and to alphabetise its speakers. For the analyses, the author uses the structural method, i.e. the analysis is both descriptive and explicative. First of all, this concerns a synchronic analyse, but in light of the complexity of the data, the author also respects the diachronic explanations. This work is one of the first descriptive grammars of the language Pólrì, since it combines phonological as well as morphological and syntactical aspects. To sum it all up, the book brings innovations and re-developments in the field of knowledge of the Bantu languages.